I couldn't believe my eyes when I heard about Britney Spears coming to the Philippines, and when it happened I almost cried at Mall of Asia Arena. Did you see how happy she was with the reception of Filipinos? How about the recent viral singing after the concert? Ohhh if you've loved how that went, Smart Communications said it doesn't end there! If you've loved these past HUGE events, #SmartMusicLive is about to make it even BIGGER by bringing in MORE concerts because they can! If you are following their social media channels (especially Facebook! ), you'll get access to FREE TICKETS, BEHIND THE SCENES EVENTS, the chance to MEET AND GREET the artists, other PERKS and PRIVILEGES that you can have just by being a SMART Subscriber. Does that sound good? Well let's get you more artists #LikeNeverBefore for this year like these guys for IN THE MIX! 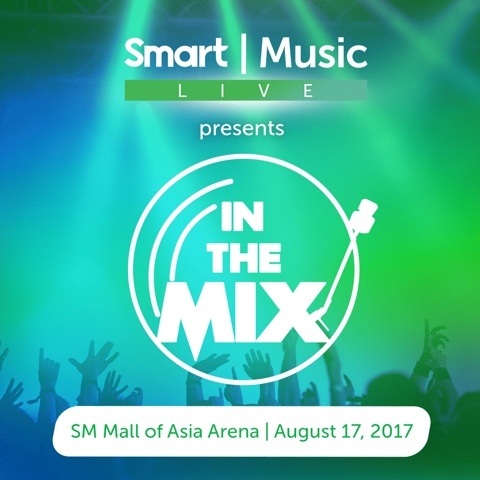 In the Mix 2017 Music Fest features 5 Seconds of Summer, Zara Larsson, Two Door Cinema Club, DNCE (my favorite Cake By The Ocean haha), DAYA, DUA LIPA. It was so successful last year that they had to do another installment and I can't see why not! Another icon, another Pop superstar with pipes that can blow you up because darn nabbit she can sing! The one and only Dangerous Woman Tour of Arianna Grande will be in Philippine shores very soon. You know her hits enough to sing it in the shower like I do and boy she's so fine you would never want to miss this concert. 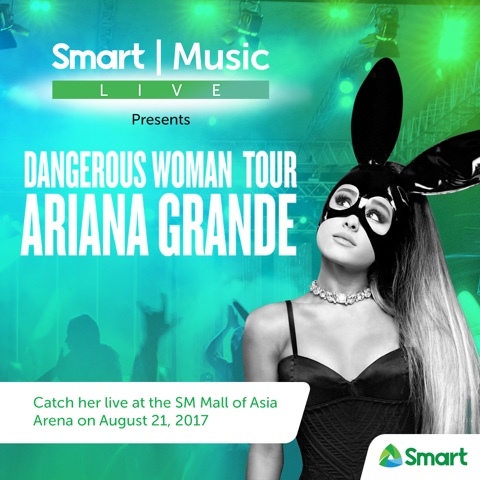 Both In the Mix and the Dangerous Woman Tour will be held in Mall of Asia Arena. If you think this ain't enough, this Friday would be a momentous occasion for Beliebers! Are you ready for Justin Bieber? 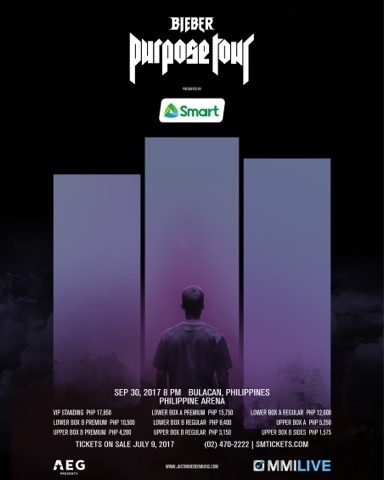 Pre-selling of tickets are ON courtesy of Smart Communications for the Bieber Purpose Tour. It will be held at the BIGGEST outdoor arena in the world, Philippine Arena in Bocaue, Bulacan. You can just text SMARTLIVE to 9999 starting today July 6, 2017 to get a reservation code. It will allow you to purchase a maximum of two (2) tickets within the same section on July 7, 2017. This will be exclusive for all SMART subscribers like me. If you want to know more, just check out their page for complete mechanics at http://smart.com.ph/Pages/musiclive.